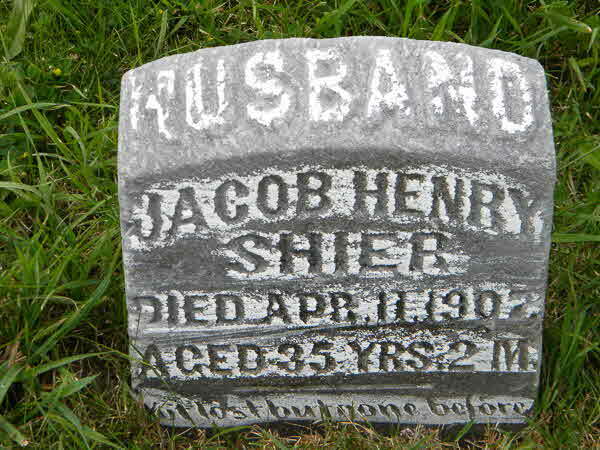 Marriage* Jacob (Henry) Shier married Dora Parish on 8 January 1903 in Leaskdale, Ontario County, Ontario, Canada. 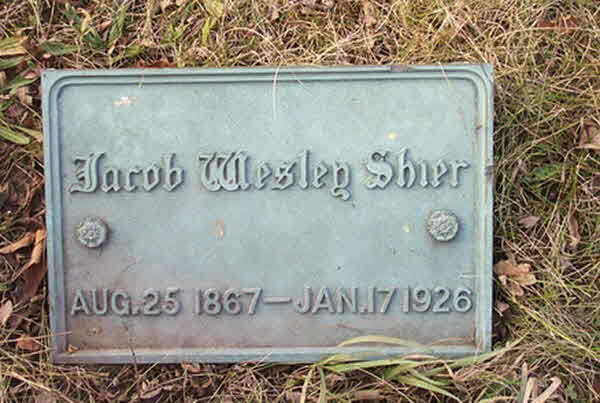 Death* He died on 17 January 1926 in Lot 25, Conc. 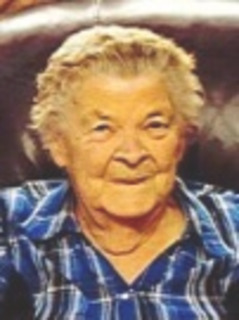 2, Georgina Twp., Simcoe County, Ontario, Canada, at age 58. 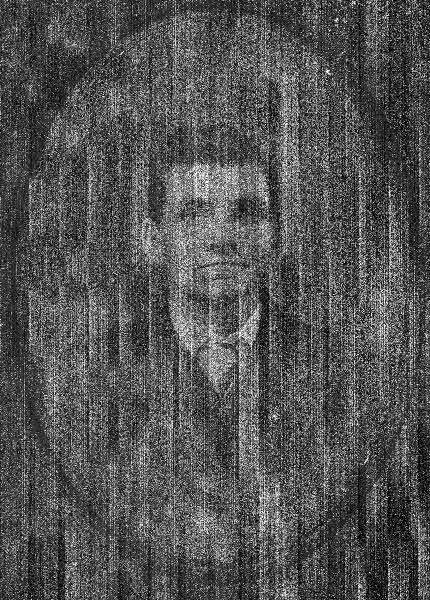 Burial* He was buried on 17 January 1926 in Ontario County, Ontario, Canada. 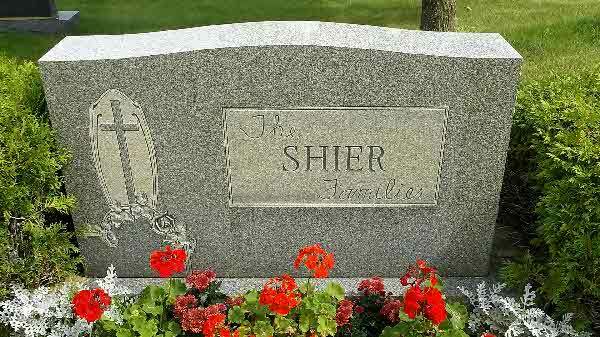 I, Jacob Shier of Ryanroe in the County of Limerick and Parish of Adare by the Grace of God kept in possession of a sound mind but with a weak body do make this my last Will and Testament. 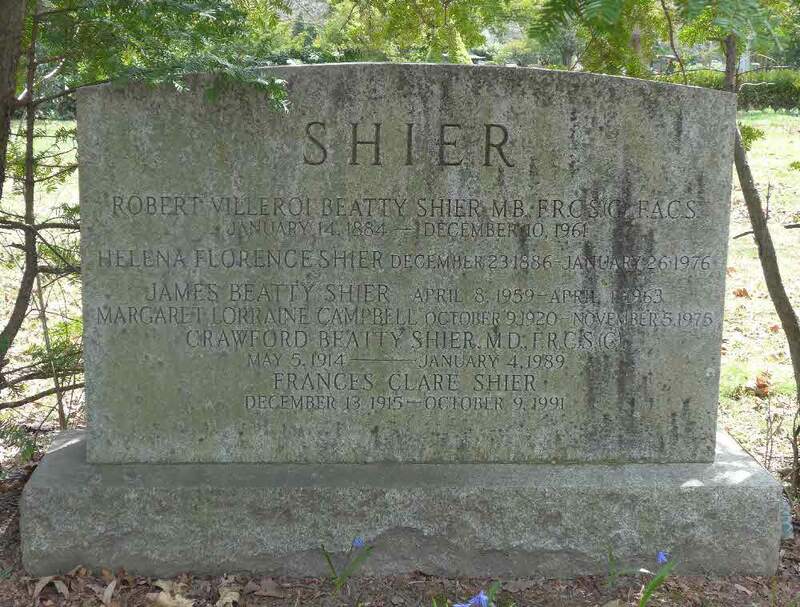 First I order that my body be decently interred in Adare Chruch yard at the right side of my beloved wife Mary Shier and it is my sincere wish that my wife Catherine Shier be buried at my right hand side. 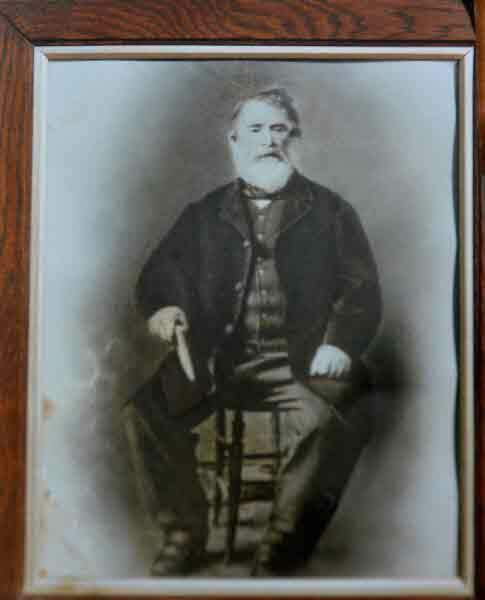 Second, I leave to my son John Jacob Shier (£150) one hundred and fifty pounds stg. to be paid him one year after my death. He is to be provided with suitable clothes and diet during that period. He is to be obedient to his step-mother and help her to cultivate the land during his stay with her if however he does not do so, I leave him to the mercy of his step-mother and the other executors. 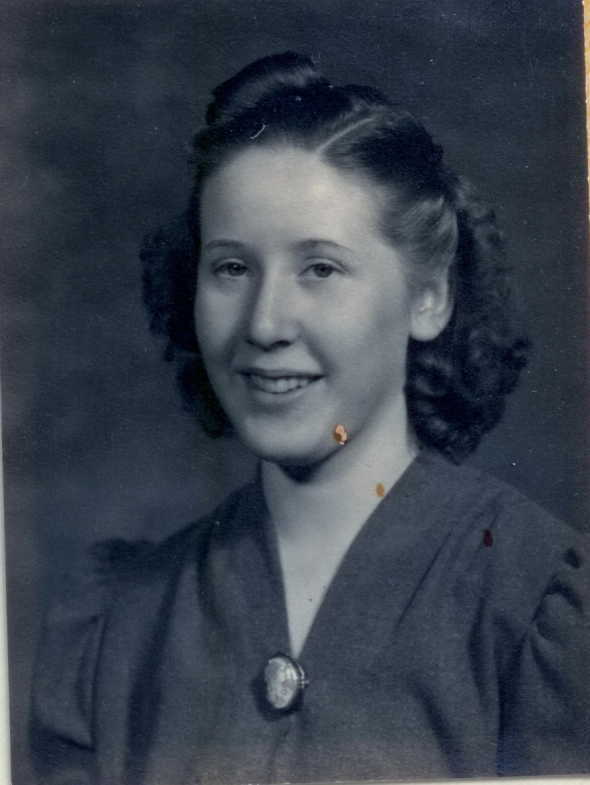 Third, I leave to my daughter Mary Ann Shier the sum of (£150) one hundred and fifty pounds stg. to be paid to her two years after my death. 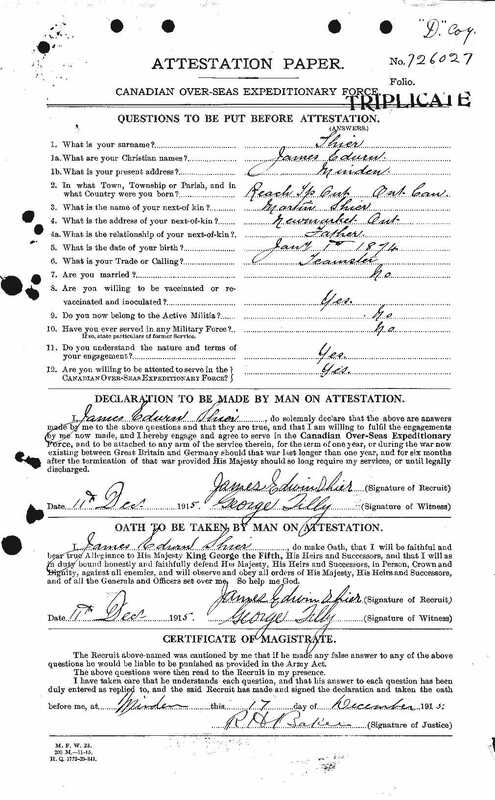 She is to stay with her step-mother but if she gets married before the above two years expire and makes a match agreeable to her step-mother she is to get the above (£150) one hundred and fifty pounds on the day that the ceremony is performed if she so desires. She is to make herself as useful as possible to her step-mother but should she not be said by her and the other executors I leave her entirely to whatever mercy they may exercise towards her. She is to be provided with suitable clothes and diet while she lives with her step-mother. 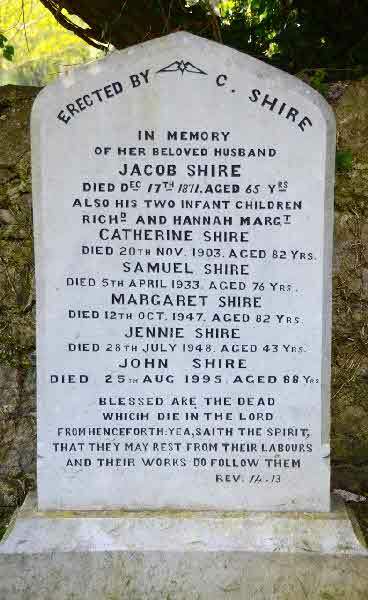 Should Mary Anne and John Jacob wish to emigrate to America two years after my death I have no objection whatever. 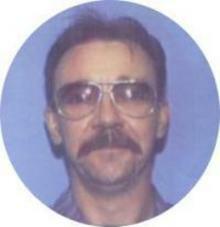 John Jacob is not to get married within one year after my death without the consent of his step-mother. The interest of John Jacob's money as above willed him by me as also the interest of Mary Anne's money as also above willed her by me shall be given to my beloved wife Catherine to help in providing them (John Jacob or Mary Anne) with respectable clothing and support. 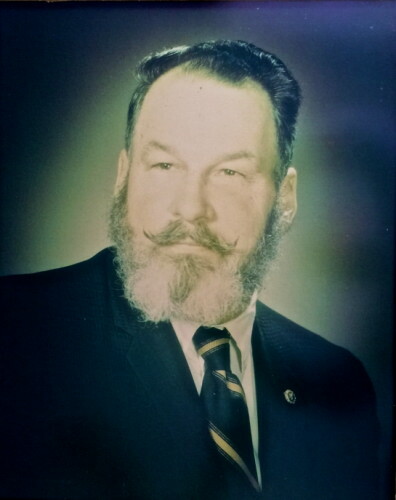 Should John Jacob or Mary Anne die before the time comes when the above provisions of this my Last Will and Testament are carried out with reference to them in either or both cases the money above willed them lapses to my Executors to be lodged in Bank or otherwise safely secured for the use of my unprovided children. 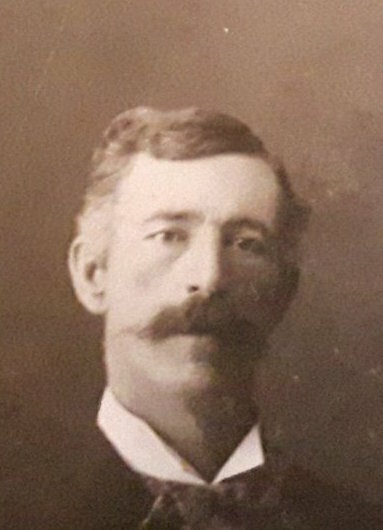 Fifth, I order that five pounds a year be paid to the Methodist Connexion in Adare during the life of John Moore. The insurance money is to be lodged in the Bank or otherwise safely invested in the name of my wife Catherine Shier and in the name of my other executors for the use of my unprovided children. Fifth, I leave to my wife Catherine Shier the entire control of all my stock and chattels , all my money in Bank, all money represented by Promissory Notes, all insurance money and all other moneys and value after paying my lawful debts for the use of herself and children that is Joseph, Samuel, Rebecca, Richard, Catherine and Emily Alice. Should however my wife Catherine Shier marrry or do anything that would disgrace my children, she is to be dispossessed out of my house and property by my other executors and she is to get only two pounds to take her to America. I appoint my wife Catherine Shier Executrix together with Richard Heavenor, Bamlett Shier and Tobias Shier as my Executors given under my hand this 16th day of December, One Thousand Eight Hundred and Seventy- One. 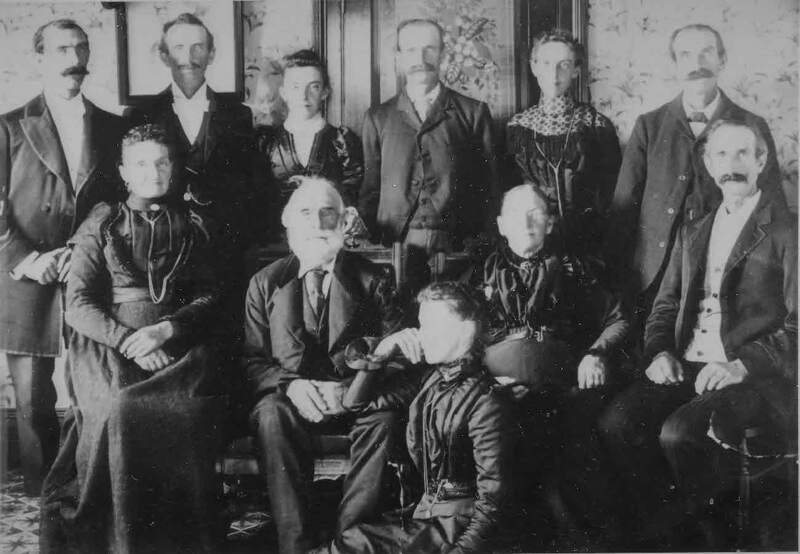 Fact 1* James Shier and Mary Ann Mooney Family. 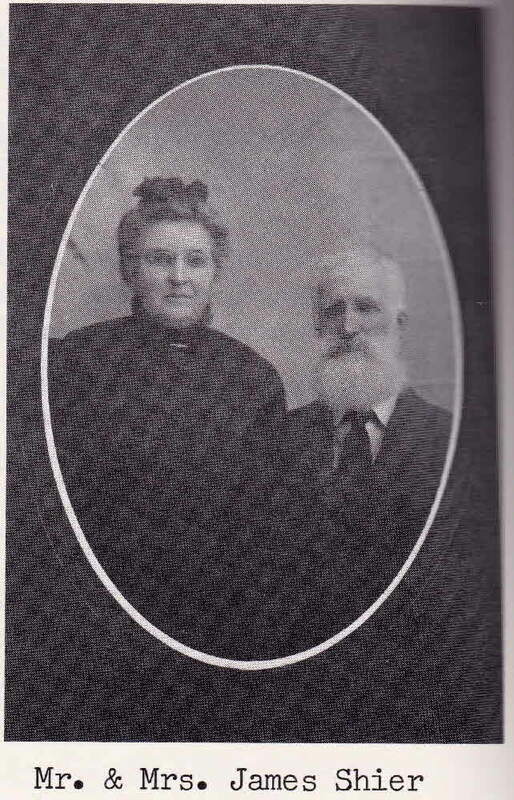 Marriage* He married Charity Dake, daughter of John Dake and Elizabeth Lewis, on 17 November 1910. 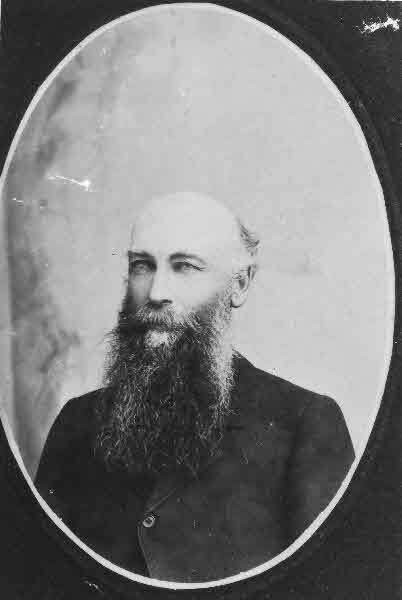 Death* He died on 3 October 1919 in Georgina Twp., York County, Ontario, Canada, at age 88. 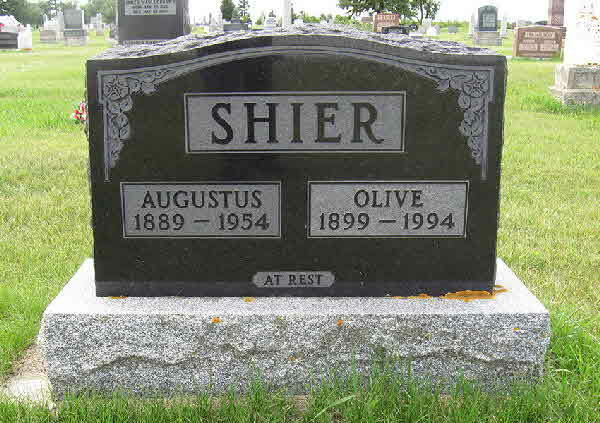 Burial* He was buried in Foster Memorial Cemetery, Scott Twp., Ontario County, Ontario, Canada; Stone is in Foster Memorial Cemetery, but death certifcate states burial took plae in Zion Cemetery, Zephyr, Ontario. 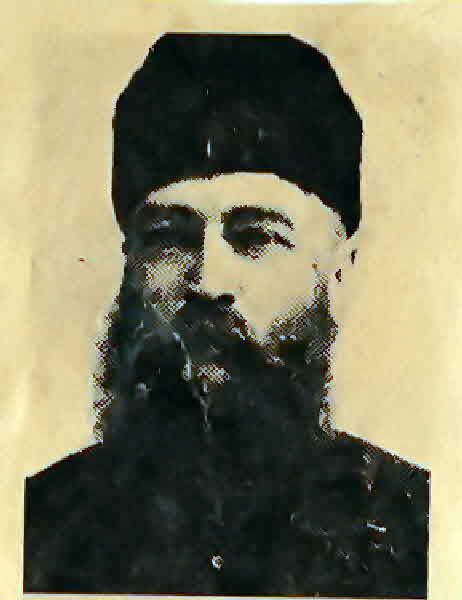 Death* He died on 20 January 1929 in Huron Twp, Bruce County, Ontario, Canada, at age 85. 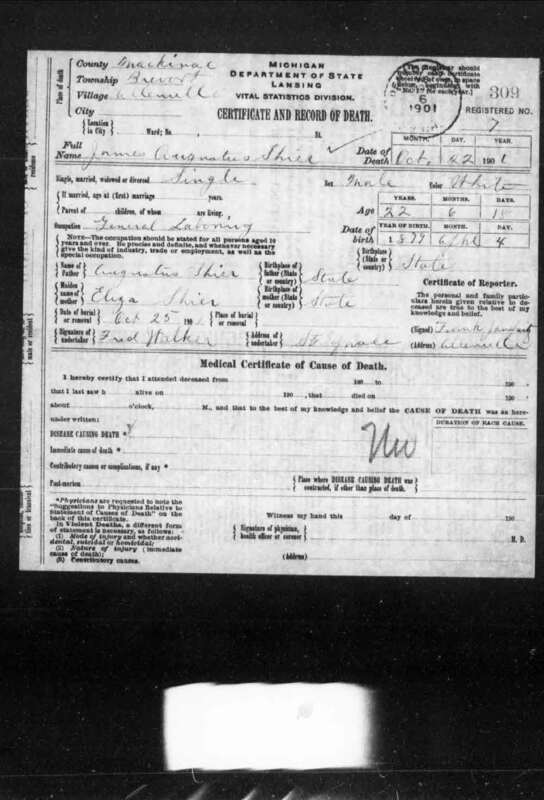 Burial* He was buried on 22 January 1929 in Ripley, Bruce County, Ontario, Canada. 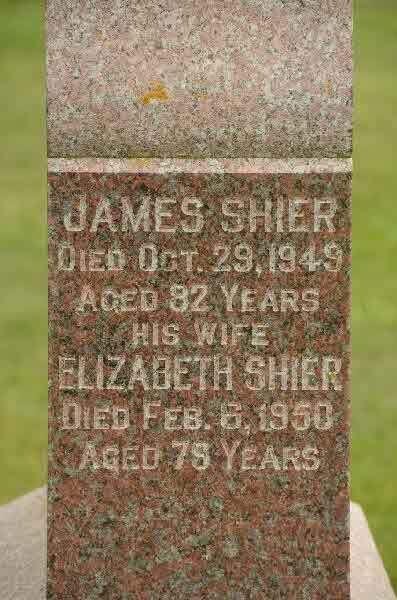 Death* James Shier died on 6 January 1906 in Stillborn, Cannington, Ontario County, Ontario, Canada. 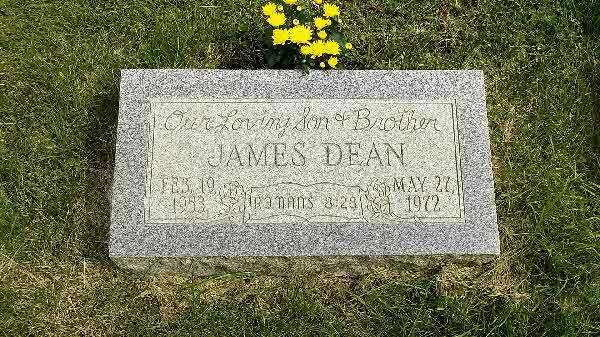 Burial* He was buried in Forest Lawn Cemetery, Detroit, Wayne County, Michigan, United States. 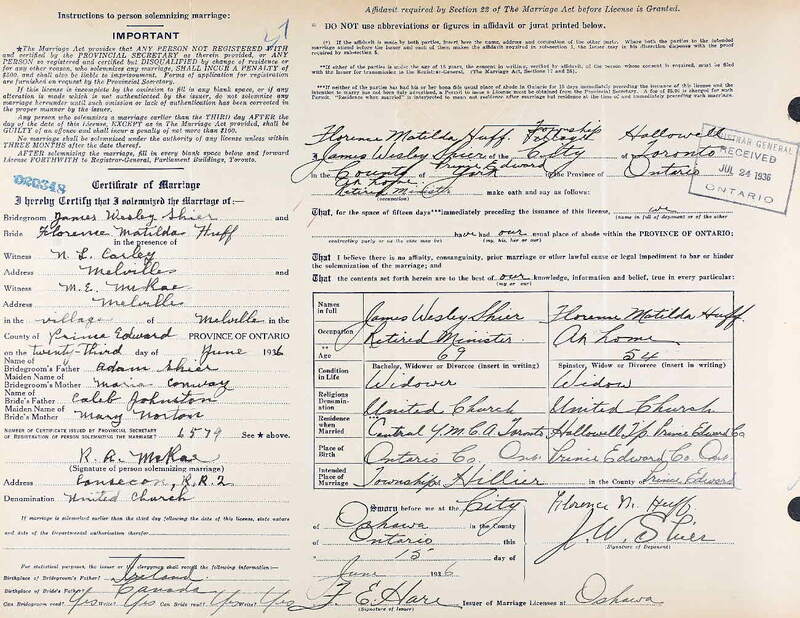 Marriage* James Albert Shier married Ethel Mina Robinson, daughter of James Robinson and Susan Saul, on 2 April 1902 in Lennox and Addington County, Ontario, Canada. 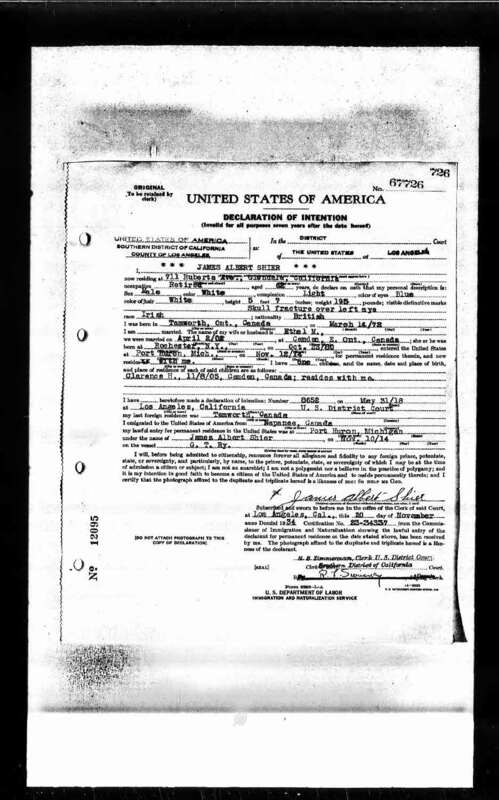 Immigration* He immigrated on 31 May 1918 to Los Angeles, California, United States. 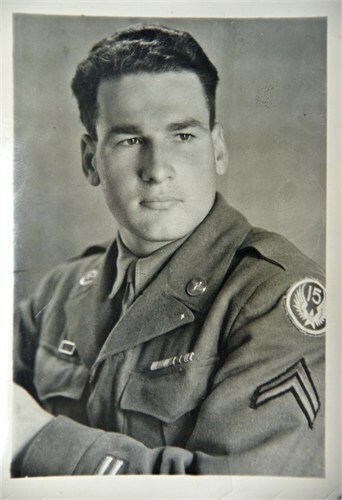 Burial* He was buried in Forest Lawn Memorial Park, Glendale, Los Angeles County, California, United States. 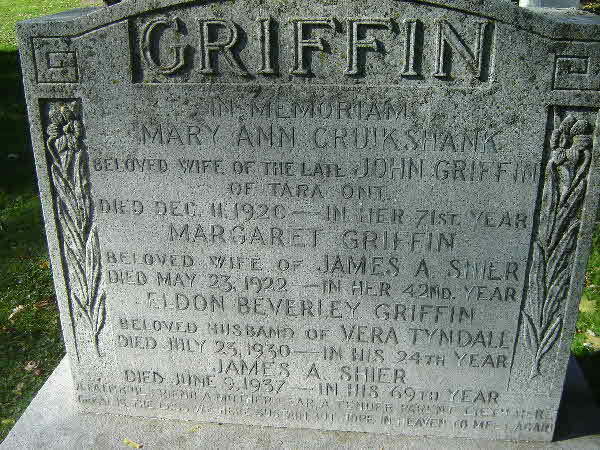 Marriage* James Alfred August Shier married Margaret Griffin, daughter of John Griffin and Mary Ann Cruickshanks, on 22 August 1905 in Toronto, York County, Ontario, Canada. Death* He died on 9 June 1937 in Toronto, York County, Ontario, Canada, at age 68. [S26] Unknown record type: unknown subject, by unknown photographer; unknown series; unknown repository, unknown repository address. 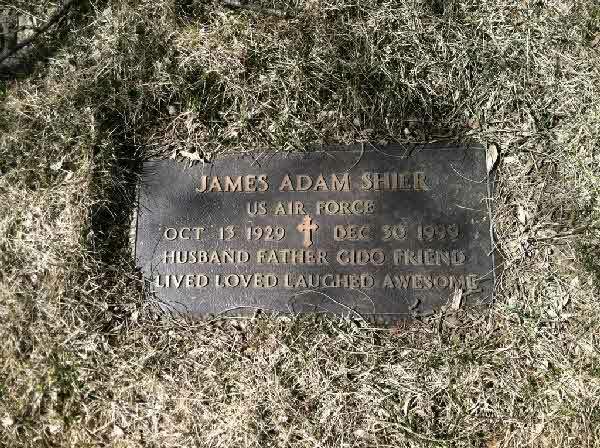 Online unknown url; unknown file name, Death Index for James A. Shier. 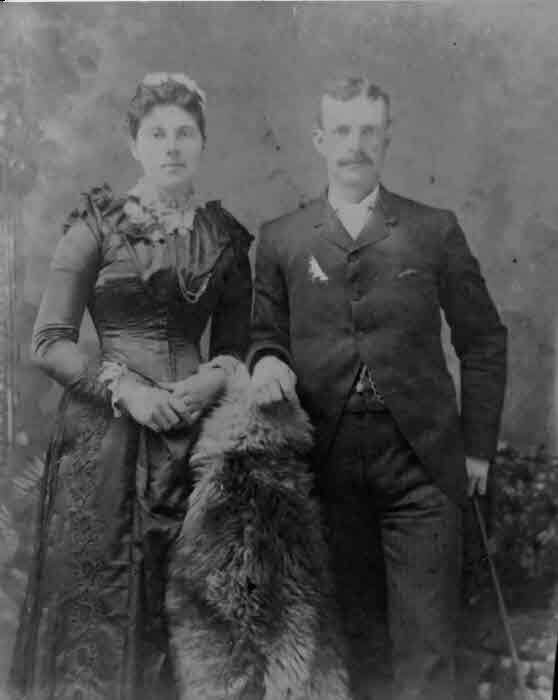 Marriage* James Baptist Shier married Genette Ann Banen on 18 June 1885. 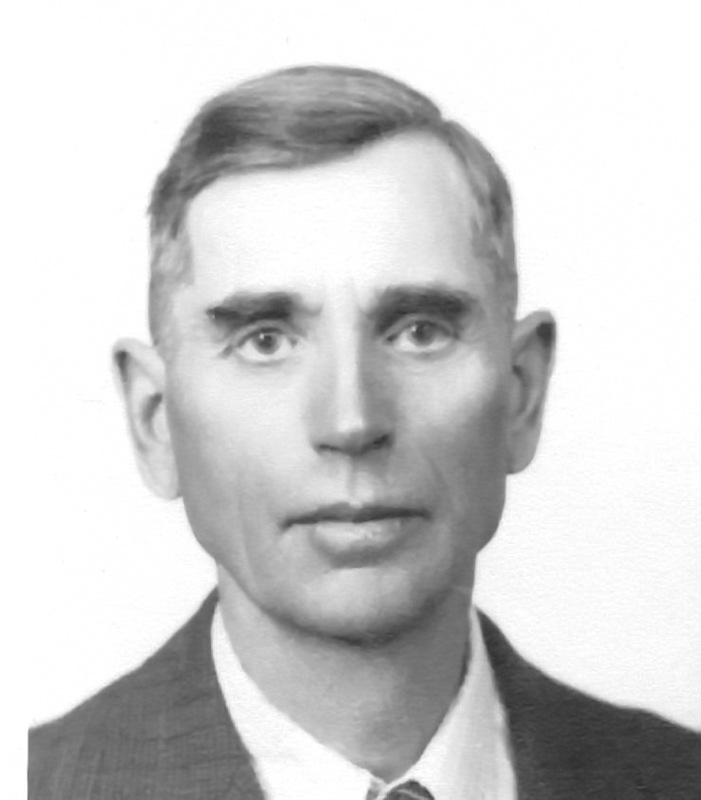 Marriage* He married Jane Green, daughter of Andrew Burnhower and Catherine Samantha Steele, on 18 November 1921 in Belleville, Hastings County, Ontario, Canada. 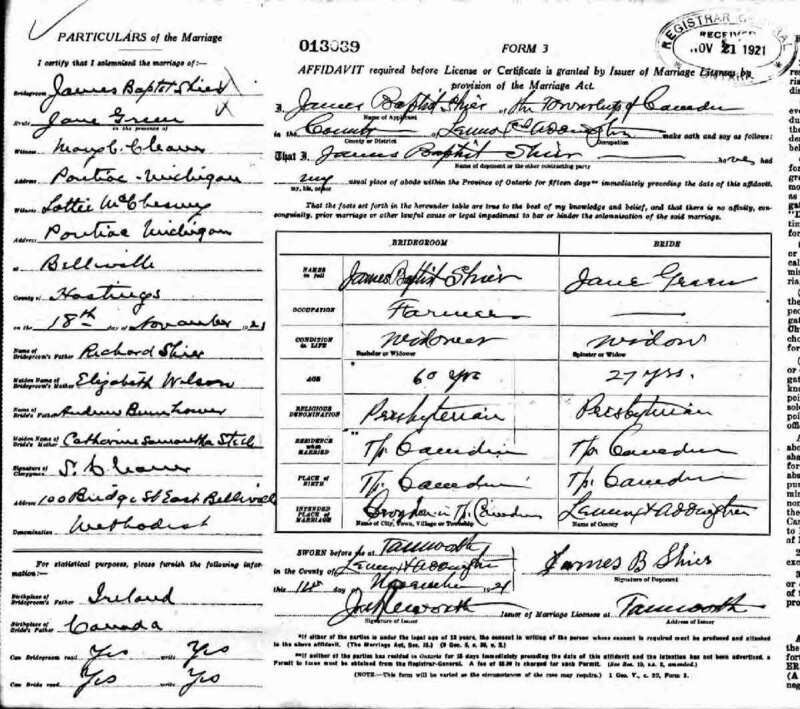 Marriage* James Corneil Shier married Amelia Ella (Millicient) Kirvan, daughter of Joseph Hill and Sarah Jane Fawcett, on 24 November 1909 in Toronto, York County, Ontario, Canada. Death* He died on 25 August 1937 in Toronto, York County, Ontario, Canada, at age 65. 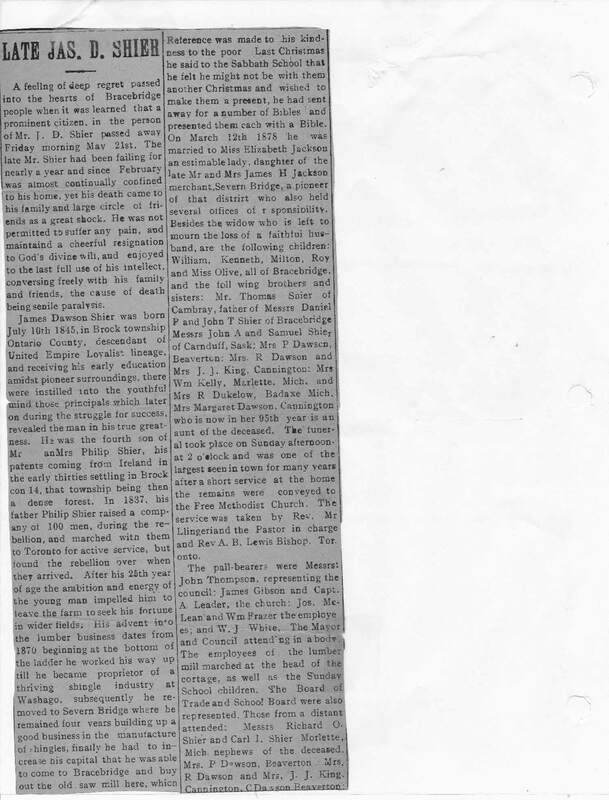 (Witness) Fact 1 James Dawson Shier witnessed the Fact 1 of Jonathan Shier on 14 November 1890 in Woodham, Perth County, Ontario, Canada; Ledger for Jonathan Shier's store showing an account and business transcations with his 4th cousin, James Dawson Shier, Bracebridge, Ontario. 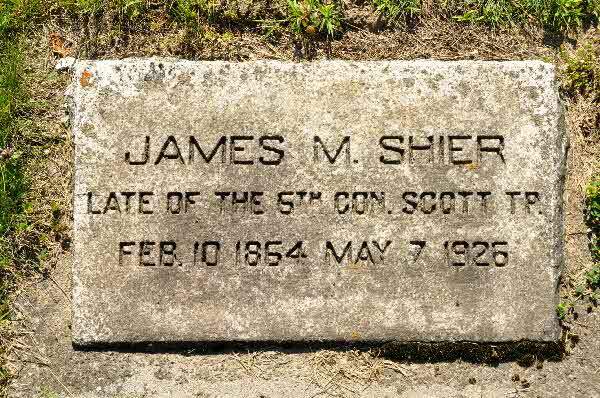 Fact 1 James Dawson Shier's lumbermill was destroyed by fire. Fact 1 Photo of the J. D. Shier Lumber Compound in the area known as Shiertown in Bracebridge, Ontario. 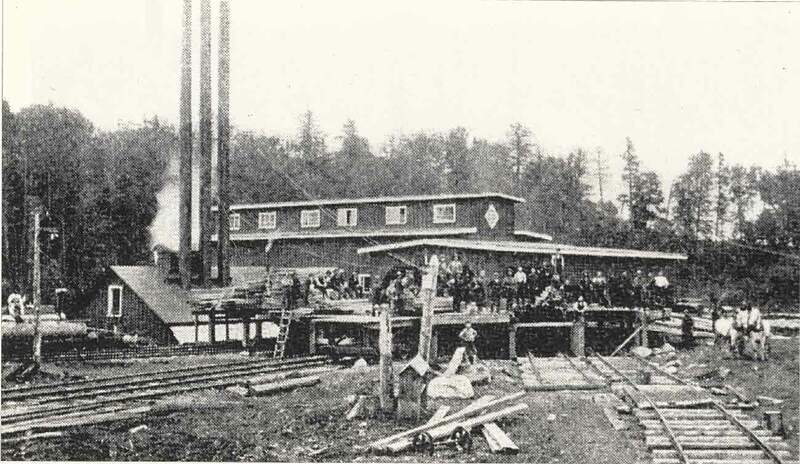 In 1902 Shier's sawmill was destroyed by fire for the second time. 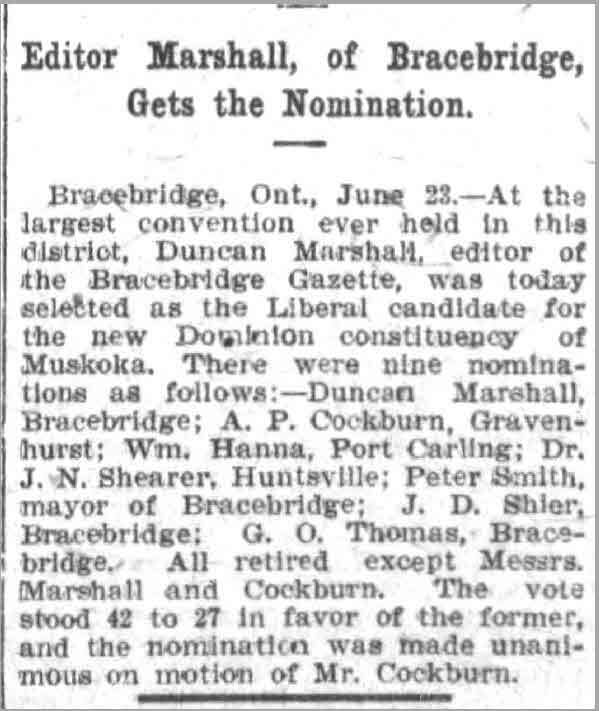 Fact 1 James Dawson Shier was a candidate for the Liberal nomination in the new Dominion Constituency of Muskoka. 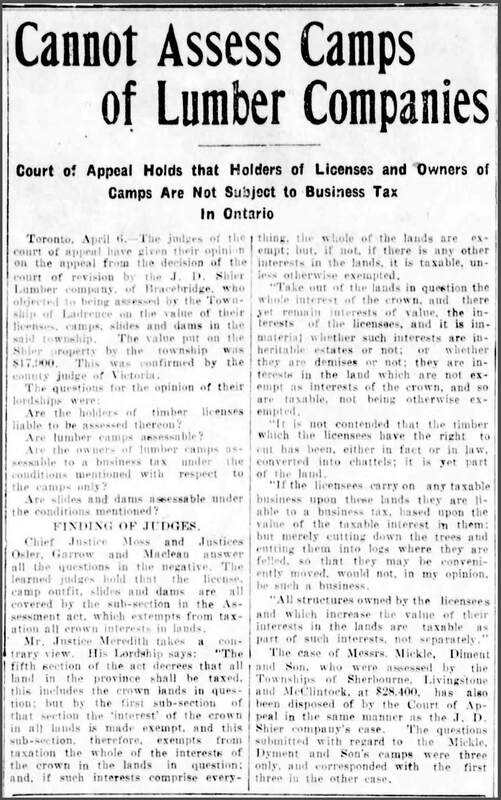 Fact 1 The Court of Appeal determines that municipalities Cannot Assess Camps of Lumber Companies. Death* He died on 21 May 1915 in Bracebridge, District of Muskoka, Ontario, Canada, at age 69. Burial* He was buried in Bracebridge United Cemetery, District of Muskoka, Ontario, Canada. 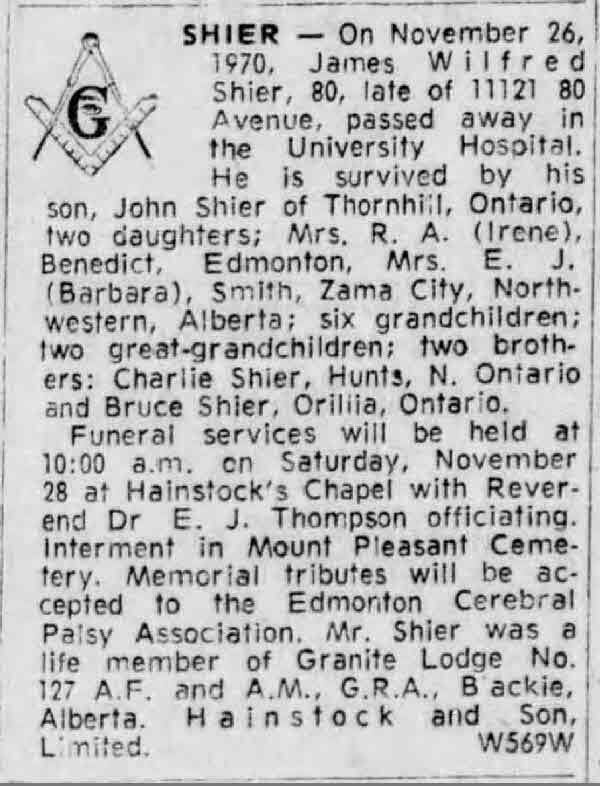 Fact 1 Obituary of James Dawson Shier Pt. 2. 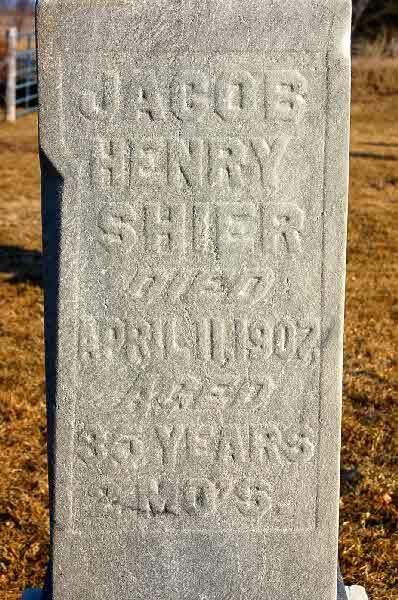 Burial* He was buried in Maple Hill Cemetery, Cadillac, Wexford County, Michigan, United States. 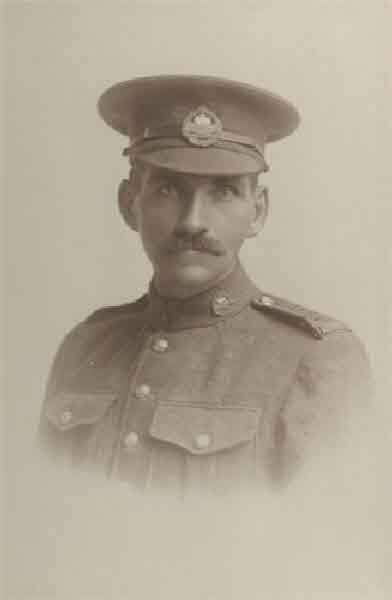 Milit-Beg* He began military service on 17 December 1915 in Minden, Simcoe County, Ontario, Canada. Burial* He was buried in Minden Village Cemetery, Minden, Haliburton County, Ontario, Canada. 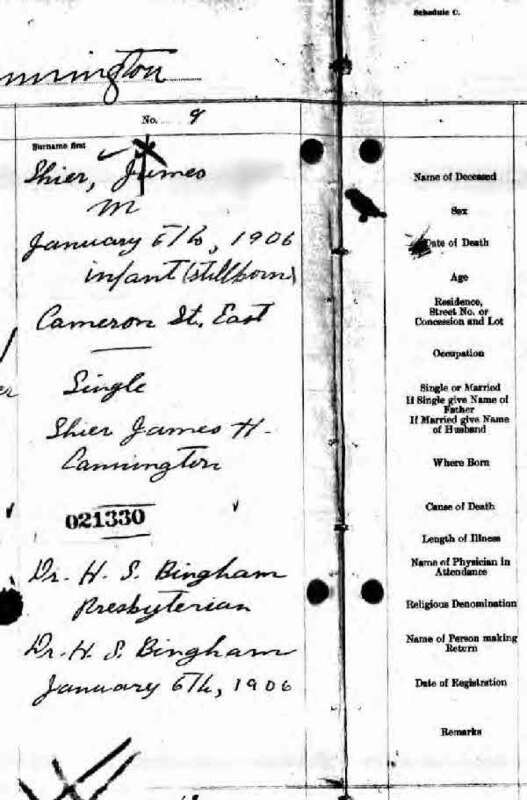 [S15] Unknown volume, Wesleyan Methodist Baptismal Register, unknown repository, unknown repository address. 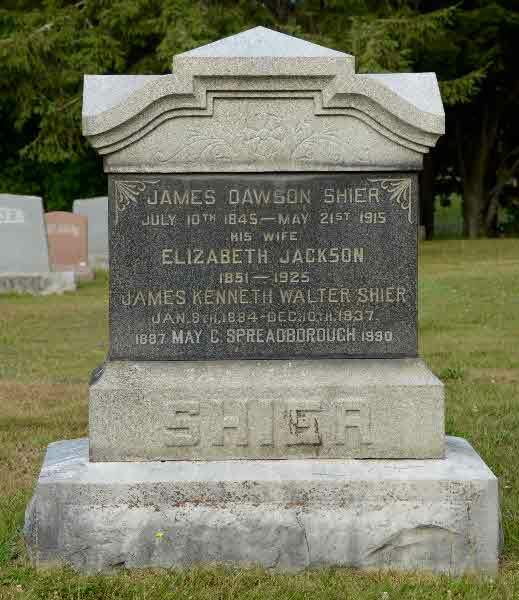 Marriage* James John Shier married Elizabeth (Lizzie) Burnie, daughter of James Burnie and Mary Ann Lawrie, on 19 January 1898 in Georgina Twp., York County, Ontario, Canada. 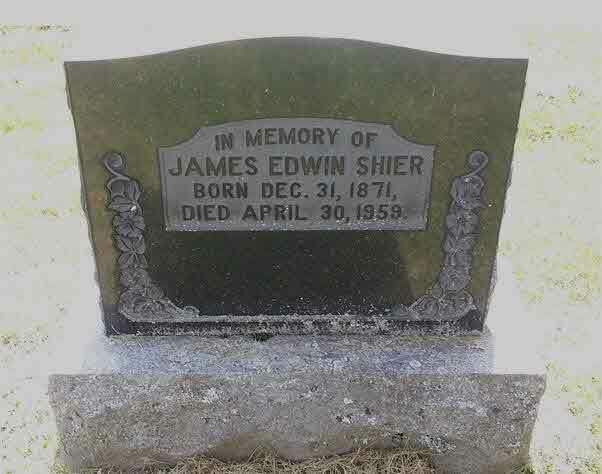 Death* James John Shier died on 15 April 1917 in Penetanguishene Asylum, Penetanguishene, Simcoe County, Ontario, Canada, at age 53; The Penetang Asylum for the Insane opened on August 15, 1904. 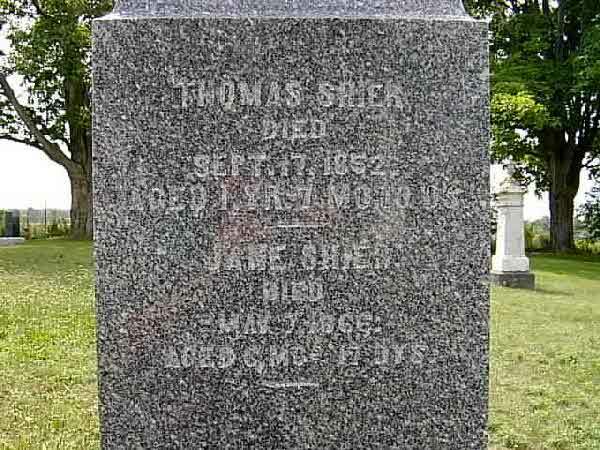 Burial* He was buried in Hillman Cemetery, Reach Twp., Utica, Ontario County, Ontario, Canada. 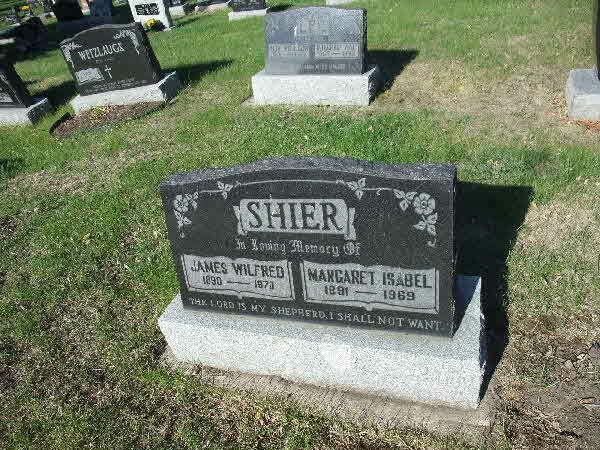 Marriage* James Mooney Shier married Catherine Ann Shier, daughter of Jacob Shier and Catherine Rynard, on 9 April 1890 in York County, Ontario, Canada. 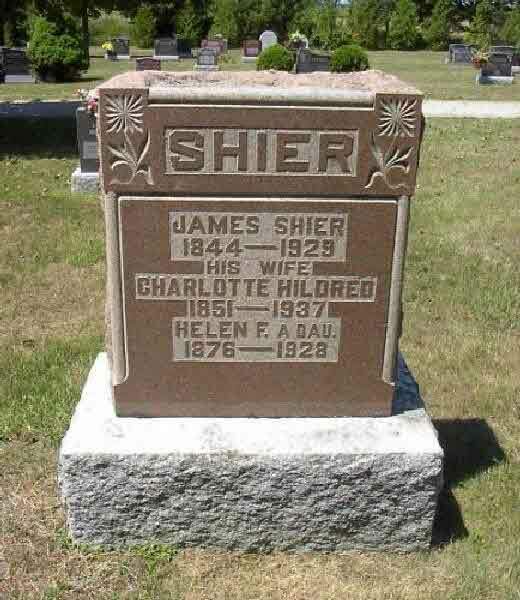 Fact 1* James Mooney Shier and his wife and 2nd cousin, Catherine Ann Shier. 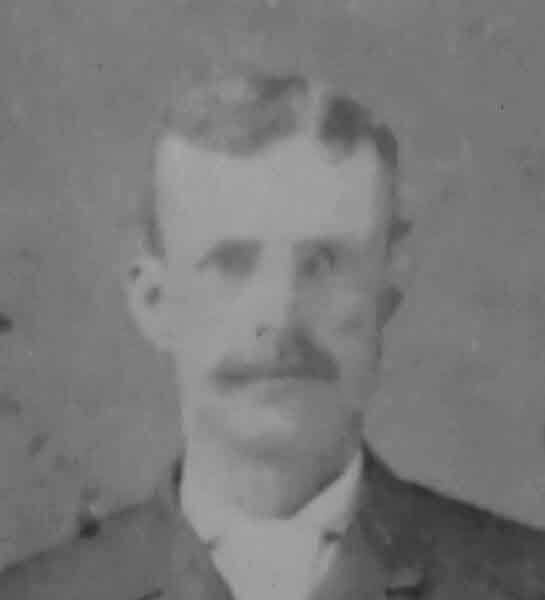 Death* He died on 7 May 1926 in Scott Twp., Ontario County, Ontario, Canada, at age 62. 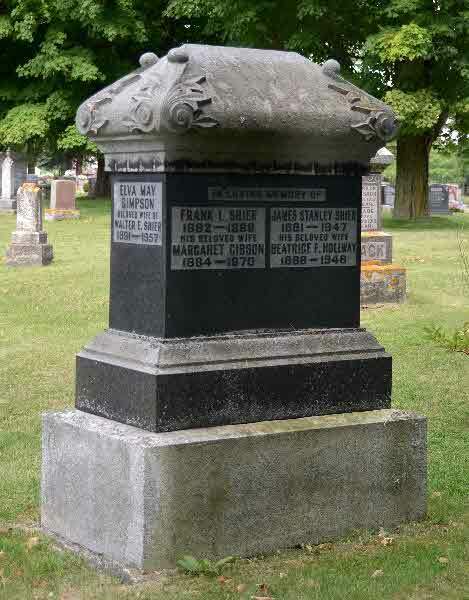 Burial* He was buried on 10 May 1926 in Uxbridge Cemetery, Uxbridge, Ontario County, Ontario, Canada. Death* He died on 21 January 2005 at age 47; Suddenly, on Friday, January 21, 2005, at his home in Toronto, at age 48. 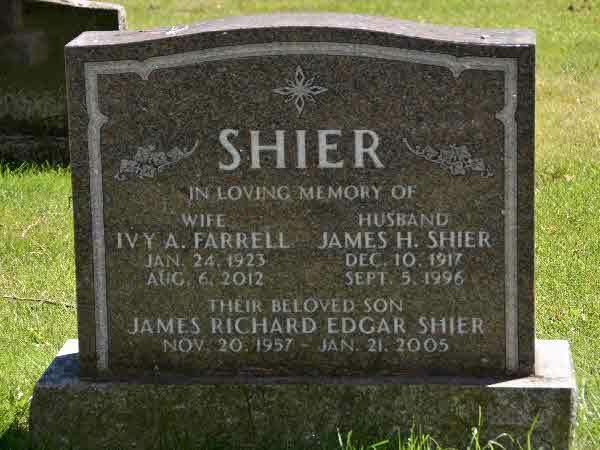 Rick Shier, loving son of Ivy and the late Jim Shier of Port Perry. Loved brother of Kathy Greenfield of Ajax. Dear uncle of Vanessa and Brayden. 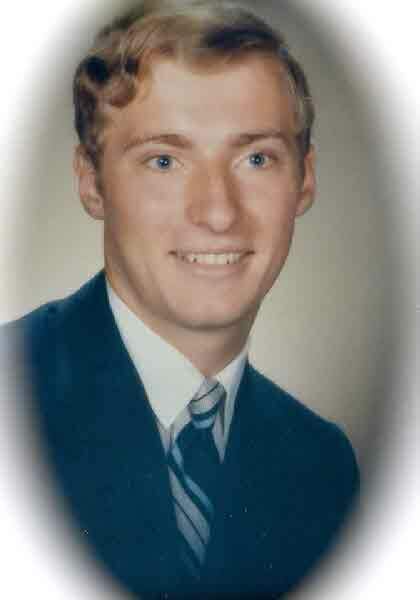 The family of Rick Shier will receive friends at the WAGG FUNERAL HOME, "McDermott Panabaker Chapel", 216 Queen Street in Port Perry (905 985 2171) on Friday, January 28th from 2-4 and 7-9 p.m. A Service to celebrate his life will be held in the Chapel on Saturday, January 29th at 11 a.m. Private interment Hillman Cemetery, Utica. If desired, memorial donations may be made by cheque to the Canadian Cancer Society or Charity of your choice. 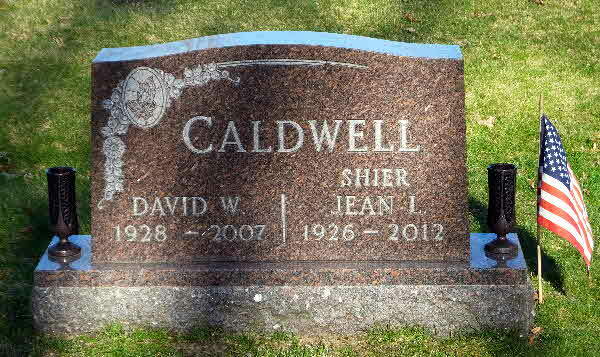 Burial* He was buried on 29 January 2005 in Hillman Cemetery, Uxbridge Twp., Utica, Ontario County, Ontario, Canada. 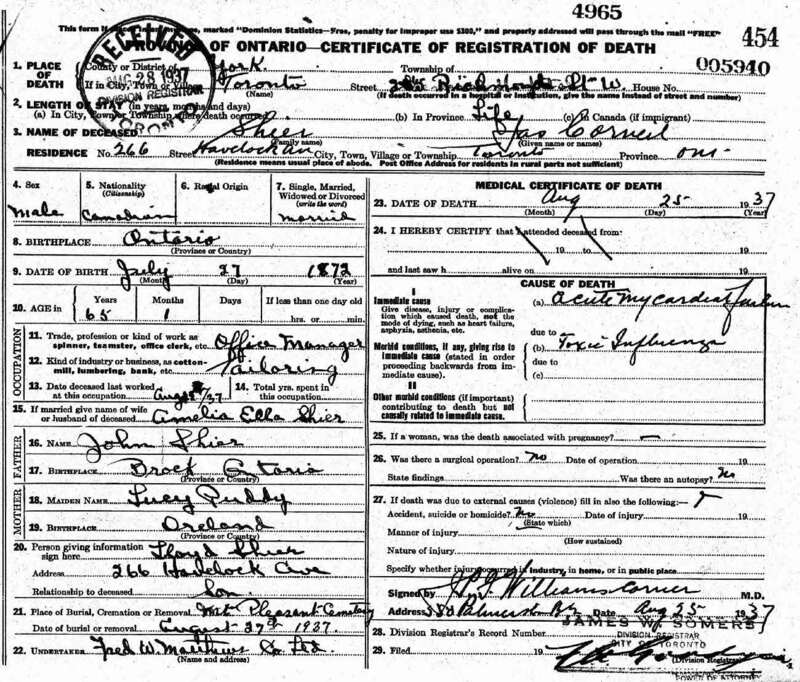 Marriage* James Stanley Shier married Beatrice Fenwick Hollway on 16 September 1909 in Toronto, York County, Ontario, Canada. 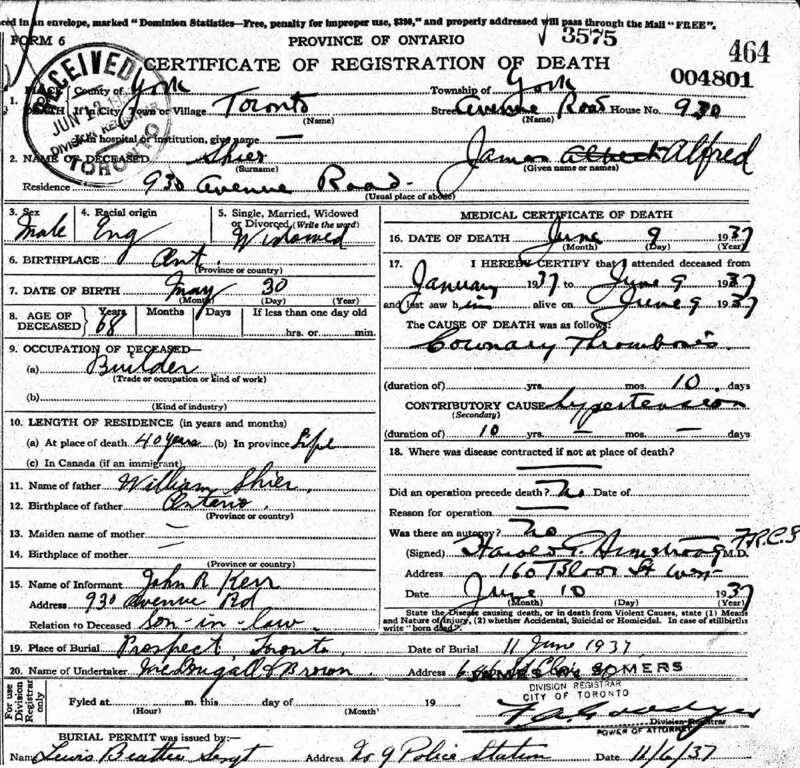 Death* James Stanley Shier died in 1947 in Ontario, Canada. Marriage* He married Florence Matilda Johnston on 23 June 1936 in Melville, Prince Edward County, Ontario, Canada. 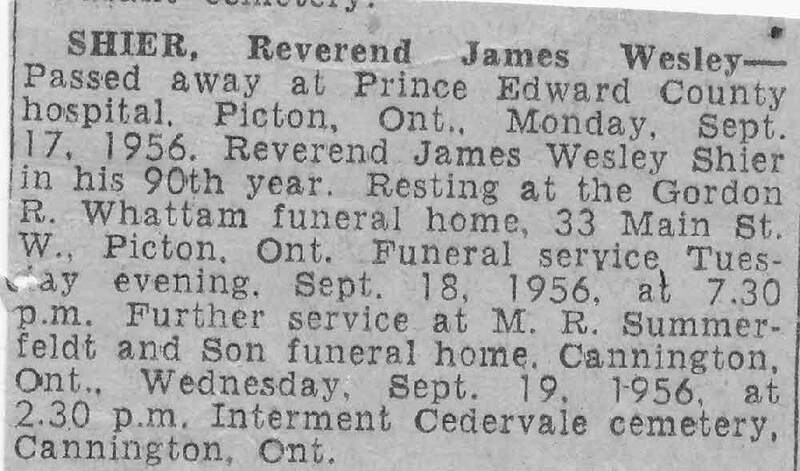 Death* He died on 17 September 1956 in Prince Edward County Hospital, Picton, Prince Edward County, Ontario, Canada, at age 89. Death* He died on 25 November 1970 in University Hospital, Edmonton, Alberta, Canada, at age 80. Burial* He was buried in Mount Pleasant Municipal Cemetery, Edmonton, Alberta, Canada. 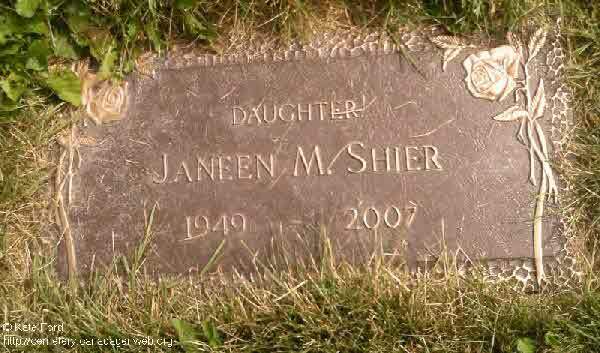 Birth* Jania Beatrice Shier was born on 5 February 1875 in Arran Twp., Bruce County, Ontario, Canada. 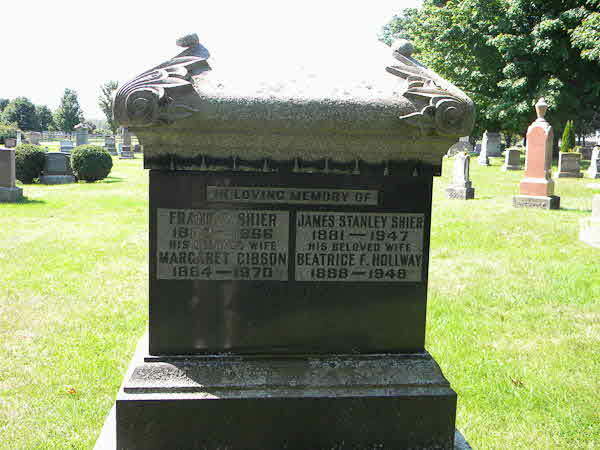 Burial* She was buried in Bailey Cemetery, Lowell, Kent County, Michigan, United States.